Another What I Ate Wednesday and I feel like I’m just along for the ride. I have nothing really exciting to share but of course that will never stop me from sharing. One time I had NO food pictures and still linked up! We are of course talking about the fun link-up hostessed by Jenn at Peas and Crayons. Be sure to stop by there today. It’s been a weird week in a lot of ways and I’m trying to get myself into a better, healthier routine. 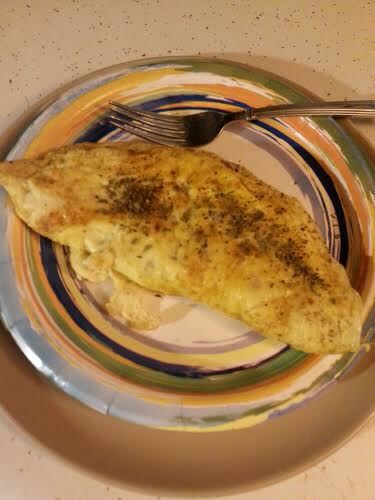 Getting my protein in with an omelette with white beans. Sounds a little strange and I did use if for Strange But Good on Friday. It was tasty with a good boost of protein. I like that in a breakfast! I’ll do this again! As is almost always my way, there was a crock pot full of Weight Watchers veggie soup cooking on the counter at some point. This was a particularly good batch. It was good to the last drop. 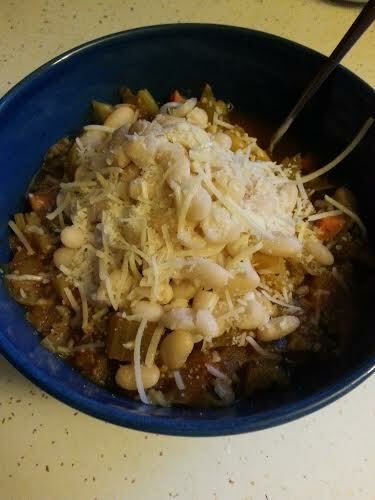 I had mentioned that I’d never cooked the white beans specifically to use them in the soup. It was a great idea and I will doing it again. My favorite meal! My sister, Ele took a little break on Sunday afternoon. We went to one of our favorite places, Barnes and Noble. 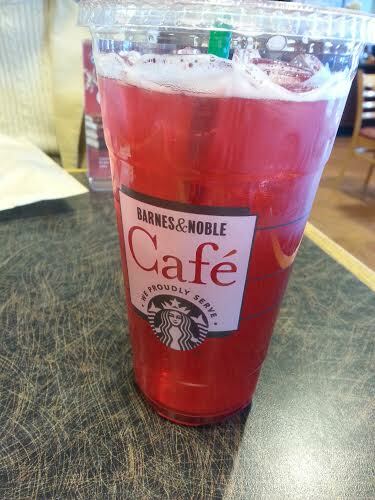 It was an iced passion tea lemonade. They have an option of having it half sweet, which I’d never heard of before but I took advantage of it. It was tangy and a little sweet and very refreshing. I’ll do it again! I’ve been eating a lot of eggs lately for breakfast. I do that mostly because I feel that I stay satisfied longer with them. It’s been a long time since I’ve thought of overnight oats in a jar. I actually thought in advance yesterday and put some together. 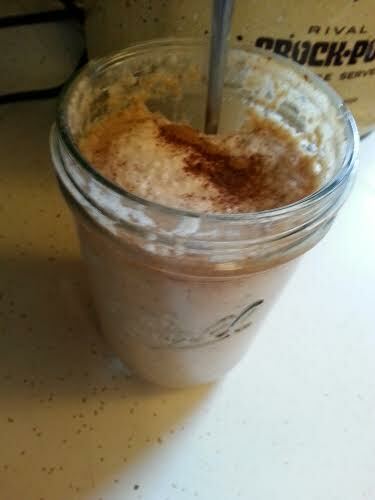 Oats, fat-free Greek Yogurt, almond milk, unsweetened apple sauce, cinnamon and pumpkin pie spice. Also added a little Truvia because I forgot to add it when I put it together. I like mine warm so I heat it in the microwave for about 2 minutes. I know that’s probably considered sacrilege but that’s the way I like it. You’ll probably take note of the crock pot in the back ground. Yes, that’s This Weeks batch of Weight Watchers veggie soup. I’m nothing if not predictable. That’s What I Ate Wednesday for me for today. Be sure to check out the link up at Peas and Crayons for some good ideas. I always do! I promise more interesting food next week! This entry was posted in Uncategorized and tagged beans, crock pot, veggies, Weight Watchers, WIAW. Bookmark the permalink. I was just thinking about how I should make a slow cooker veggie soup- this sealed the deal! I’m off to fill my crockpot with deliciousness 🙂 Happy WIAW Fran! Thanks, Liz! It is such a simple thing to do and then I have something to eat all week without having to think about it. Happy WIAW! I kind of love strange but good recipes. I seasoned a steak with cinnamon the other day (among other spices) and tried to share the recipe with my mom. She wasn’t havin it. She asked why she would risk ruining her steak with cinnamon when she could season it with things she knows she will like. Mom’s not adventurous, huh?!? 😉 I love to just toss in various spices when I’m making a stir-fry. Problem is that I often hit on something I really like and have no idea how I got there!! Oh, well, I keep trying!